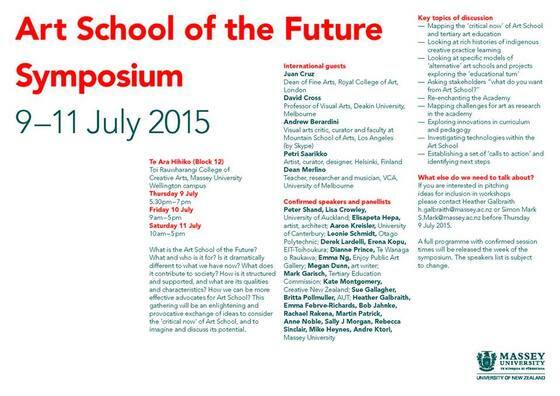 The Art School of the Future Symposium raised questions on the following subjects: What is the Art School of the Future? What and who is it for? Is it drastically different to what we have now? What does it contribute to society? How is it structured and supported, and what are its qualities and characteristics? How can we be more effective advocates for the art school? The symposium aimed to be an enlightening and provocative exchange of ideas to consider the critical now of Art School, and to imagine and discuss its potential. The Symposium took place at Massey University, Wellington, New Zealand.